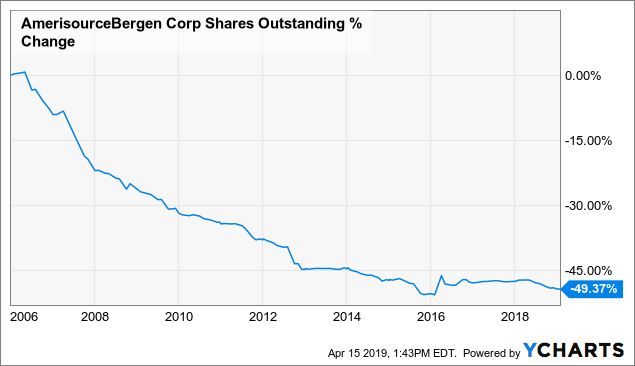 This analysis of AmerisourceBergen uses a 10-year time frame and assumes a recession will occur at some point over that period. It analyzes expected returns from sentiment reversion to mean, earnings growth, and business returns that weight returns to shareholders more heavily. It also explains the factor that I think is most important when dealing with stocks that are currently out of favor or businesses which might be experiencing slower future earnings growth. Traditionally, most of my analysis on Seeking Alpha has focused on how to avoid losses and how to profit from the price cycles of highly cyclical stocks. When dealing with highly cyclical stocks, it's usually a good idea to evaluate potential returns over a relatively short 5-year time frame because the stock prices can move dramatically over short periods of time. Investing in these types of stocks requires techniques that are different than the standard analysis most investors use to evaluate a stock. There is another group of stocks, however, whose stock prices and earnings fluctuate far less than the classic cyclical stocks I have traditionally written about. While these stocks aren't as cyclical as a "classic cyclical", they are still usually subject to the short-term debt cycle (or business cycle) and to changes in sentiment (which can sometimes also have a cyclical quality about them). More recently, I have been adapting some of the techniques I've used with "classic cyclicals" so that I can apply them to less-cyclical stocks. And today's stock is one of those. One of the major assumptions that I make for both approaches is that history is the most reliable guide to the future. My experience has been that 80% of the time, even if we looked at nothing else, a stock will behave in a similar manner as it did the previous cycle or two, unless there is a disruption to its core business. For this reason, I don't rely much on predictions of future earnings or sentiment that aren't supported by their existence during past cycles. That doesn't mean that "this time is different" isn't true sometimes. It just means that my analysis isn't counting on this time being much different. That said, if I think a stock is currently a "buy" based on my 10-year, full cycle analysis, before I invest, I will examine the forward-looking trends and narratives more carefully to make sure there aren't major changes in the works that could affect the business. The main difference you'll find between my analysis and others' is that: 1) I focus on a clear 10-year time frame and the compound annual rate of growth (CARG) one might expect over that period of time; 2) I assume we will experience a recession during that time period, and I build that into the expected returns; 3) I try to calculate the expected returns based on a full business cycle; 4) I weight shareholder yields from dividends (and potentially from buybacks) more heavily because that is money actually being returned to shareholders; 5) I provide an "opportunity cost analysis" if a stock is not currently a "buy" so that we can get an idea of how likely it is the stock will trade low enough to become a "buy" over the next 4-5 years if we have a recession. As part of the analysis, I calculate what I consider to be the three main drivers of future total returns: 1) Market Sentiment Returns, 2) Full-Cycle Organic Earnings Growth Returns, and 3) Shareholder Weighted Business Returns. Then, I combine all three 10-year CARG estimates together to get an expected 10-year, full-cycle CARG estimate. Currently, I consider an expected CARG > 15% a "buy", 12-15% an "outperform", 8-12% a "market perform", 4-8% an "underperform", and < 4% a "sell". With that, let's get into the analysis. The first thing I want to examine is how cyclical ABC's earnings are, and the answer to that is: not very cyclical. It experienced one year of declines in 2005, and has managed to grow earnings every year besides that one. For that reason, I think using a 10-year time frame in order to perform our analysis is best, rather than using a shorter 5-year time frame I would use for a more cyclical stock. The component I'm trying to estimate in this part of the analysis is what sort of return I could expect 10 years from now if the P/E multiple were to revert to its mean from the previous economic cycle. In order to estimate that, I'm going to shorten the time frame of the F.A.S.T. Graph so it starts in 2006. Since 2006, ABC's normal P/E ratio is 16.2, and it currently trades at 11.3. If the stock were to revert to its mean ten years from now, that would produce a +3.67% compound annual rate of growth in the price, all else being held equal. So, that's the sort of return I think we could expect if during the next cycle sentiment reverts to what has been normal this past cycle. If we begin our measurement around the same point we were last cycle, which I estimate to be about 2006, and we adjust the annually compounded EPS growth for the amount of stock that was repurchased over this time period, we can estimate how much CARG we can expect over the next 10 years if the next cycle is similar to the previous one. Since the approximate same point in the cycle last cycle, ABC has reduced its shares outstanding by about half. Even if we take those buybacks into account and exclude them from our earnings growth calculations, ABC has grown its earnings at a CARG of about +10.20% since 2006. That's a very strong growth rate. These return estimates are more complicated than the first two, but the idea behind this is to figure out how much the company is making in cash and/or earnings per share while taking into account debt and cash levels, how much of a dividend yield it is paying to shareholders, what percentage of shares it is buying back annually, and how much cash the company is keeping for itself, all on a per share basis. Once that is complete, I assume any money the business keeps for itself will accrue over a 10-year time period, but I don't assume that it will compound (since I estimated the earnings growth in the last section). For buybacks, if the company is buying back shares when sentiment is below average, I will assume the value of the buybacks will compound over time. If they are buying back when sentiment is higher than average, I will assume the buybacks accrue but do not compound value over the 10-year time period. (This is just a way to weight the value of buybacks over time for the estimate, it isn't intended to be mathematically precise - which is fine for me, because we never know exactly what price the buybacks will be made over time anyway, so there's no sense in pretending we do.) I will assume that dividends paid to shareholders compound their value over time because shareholders can immediately reinvest the dividends in the best investment available. As I noted, this process is intended to estimate how much money the business is likely to make and how much of that money will likely be returned to shareholders via dividends and buybacks. I limit the expectation of shareholder returns by how much cash is currently being generated and the company's apparent intention of investing that cash itself or returning it to shareholders. If buybacks and dividends are more than cash flows and earnings, I will assume they are unsustainable through a full cycle that includes a recession, and I limit the shareholder return expectations to actual cash flows and/or earnings estimates I think are reasonable. Currently, ABC stock yields about 2.06%. Over the last year, the company has purchased about 4% worth of the outstanding shares back. The 10-year average is about 3.5% per year, so I think it's reasonable to assume about a 3.5% reduction per year going forward. I like to check the business's earnings yield and FCFE/EV yield in order see how likely the business is to generate enough money to continue to pay dividends and buy back shares for the next 10 years at a similar rate as it has been. 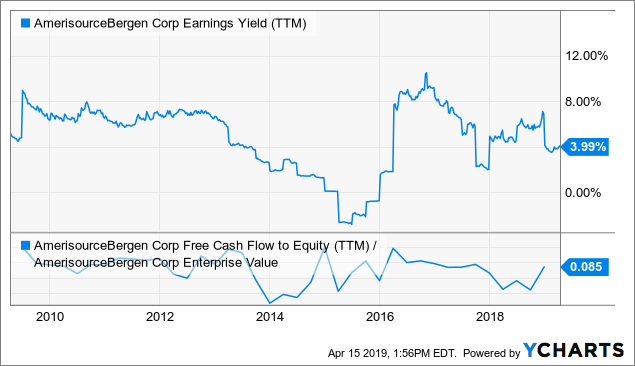 Sometimes companies borrow lots of money and take on debt in order to buy back shares or pay dividends, and that usually shows up on the FCFE/EV yield, which for ABC at the end of last year was 8.5%, enough to cover the ~5.5% yield of the dividends and expected buybacks. 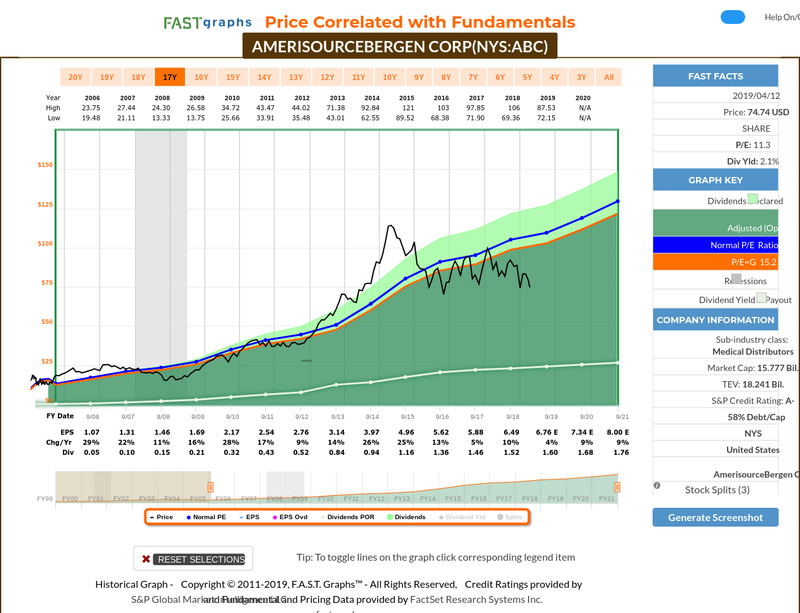 Longer term, it looks like ABC has been able to average an FCFE/EV yield in that 5-6% range, so I think estimating a dividend and buyback CARG of +5.50% over the next 10 years is reasonable. Putting all three - market sentiment returns, earnings growth returns, and business/shareholder returns - together, I estimate a full-cycle 10-year CARG return of +19.37%, if the next cycle turns out to be similar to the last one. 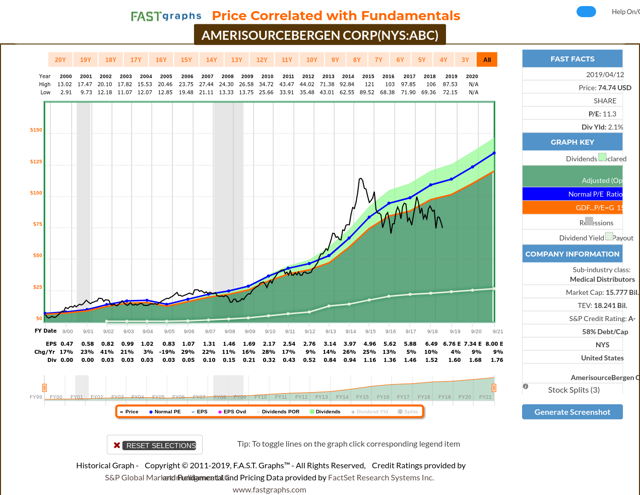 On the face of it, AmerisourceBergen looks like a buy here, but my concern is that the ~10.20% earnings growth the company experienced last cycle may not be sustainable through the next cycle, and if that is the case, perhaps we shouldn't expect a full mean reversion with regard to the P/E either. The problem is that Americans simply cannot afford to have drug prices grow at 10% per year when the economy is only growing at 3%. We have seen a two-pronged response to this phenomenon. 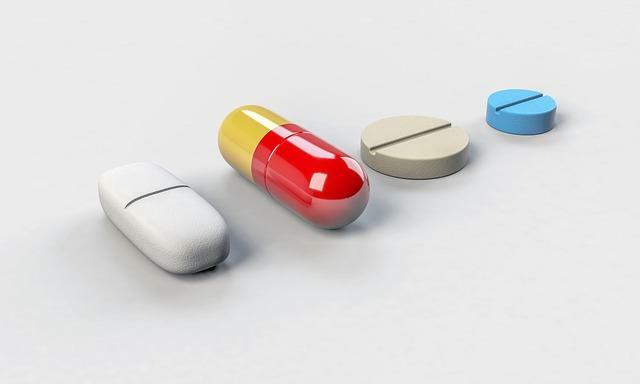 The first is from businesses, like the recent JPMorgan (JPM)/Amazon (AMZN)/Berkshire (BRK.A, BRK.B) joint venture that has the goal of lowering healthcare costs. The second is from the government, which is feeling the pressure from the constituents to lower costs by almost any means necessary. (There is also litigation over prescription drug distribution, which I lump in the 'government' category.) Putting all these together, I don't feel comfortable estimating future organic earnings growth at more than 3%. And if we see that level of real earnings growth, then I think a P/E of around 13 is a more reasonable expectation from the market than last cycle's average of 16.2. If we use a 13 multiple instead of 16.2 and run a 10-year CARG mean reversion, we get +1.41% CARG expectation instead of +3.67%. Now, if we take a 3% earnings growth return, a 1.41% mean reversion return, and 5.5% shareholder return, we get a +9.91% expected CARG over the next 10 years, assuming we have a recession at some point during those 10 years. That puts the stock squarely in my "market perform" category if purchased at its current price. If the price fell on bad headlines or some other development, assuming earnings don't fall to a growth rate of less than 3%, that would directly affect the shareholder yield/business return for ABC. You see this dynamic a lot with sin stocks or stocks that are out of favor with the public (tobacco, fossil fuels, banks, etc). If the public really hates an industry - which seems to be where we are going with regard to drug distributors - the businesses can make it up to shareholders by paying out big dividends and purchasing back lots of shares. 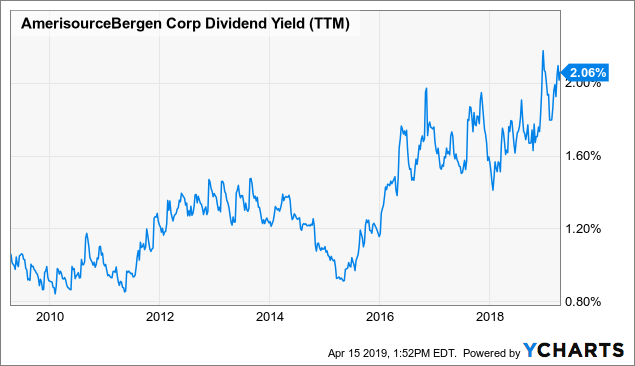 If I can't count on much price appreciation from earnings growth or market sentiment, then I require that the shareholder yield from dividends and buybacks be at least 7.18% (that's enough to double one's investment in ten years). I also require that the market sentiment is below average (so at least there is a chance for extra gains if something unexpected goes right). With ABC, I would key in on shareholder yield, because over the short term it is directly tied to the price of the stock and current profitability of the business rather than future projected growth. As the price goes down, the shareholder yield goes up. My estimates are that if ABC's price were to drop about -20%, that would get us pretty close to the 7.18% shareholder yield I'm looking for. From the stock's current price, that would be a price of about $61 per share before it would become attractive to me as a 10-year investment. Sometimes, especially when it comes to potential threats from the likes of Amazon, the market can send stocks lower first and ask questions later. Public sentiment can be a tricky thing to predict. The ultimate insurance investors have against a fickle market are dividends and buybacks. 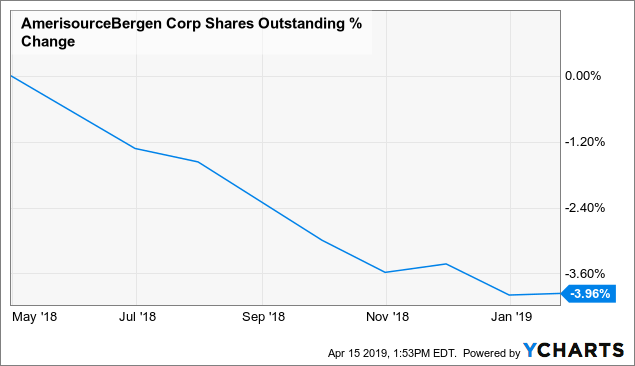 So, for a business like AmerisourceBergen that is currently out of favor and under attack, I would weight the value of those dividends and buybacks heavily when trying to value the company over the next cycle. If it is high enough, then earnings growth and market sentiment don't matter much. We've seen it with tobacco stocks over the years. While I think ABC can probably deliver returns similar to that of the market through the next cycle at today's prices, in order to do significantly better than the market, I would need a lower price of around $61 per share before I would get interested.